Update August 17 - Check your emails, I got a notice that my sample has shipped and should arrive in 5-10 business days. Originally posted August 3 - Samplesource has a new VIP Member Offer! 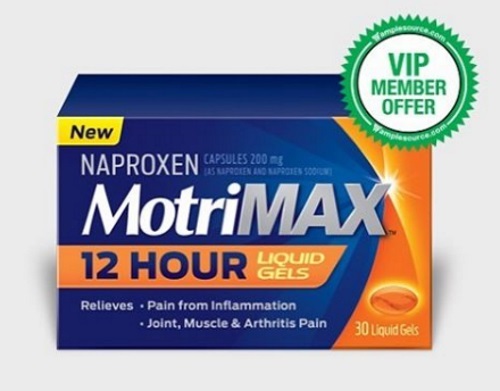 Get a Free VIP trial offer of Motrin MotriMax 12 Hour Liquid Gels! MotriMax 12-Hour is a new pain brand, from the makers of Mortrin, which provides effective pain relief for up to 12 hours. It contains Naproxen to relieve pain from inflammation, and muscle and joint pain. While quantities last. Click on the link in your email invite to request it. Sample should arrive in 3-4 weeks. You can also track your order in the confirmation email (sent right after you order). First ordered and confirmed, first served. Limit one package per address and/or email and/or IP. Check your emails to see if you were selected and sent an invite to get this product for Free! Did you get get one? Let us know on our Facebook Page!